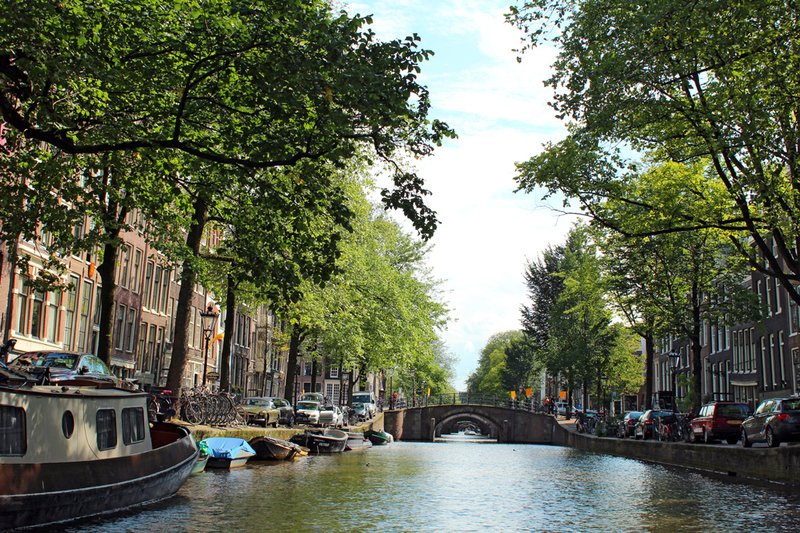 Enchanting canals probably aren’t the first thing you associate with Amsterdam, but they should be —Amsterdam actually has 165 canals, about 15 more than Venice. Inseparable from the city itself, Amsterdam canals are magical when visited from the right perspective of a small boat. It is idyllic to just sit back in the sun, soak in the good vibes and watch the city’s historic narrow houses, charming bridges and iconic landmarks slip by. The canal belt, or Grachtengordel, is a concentric belt around the old city centre made up of rings of canals lined with warehouses and merchants’ houses. 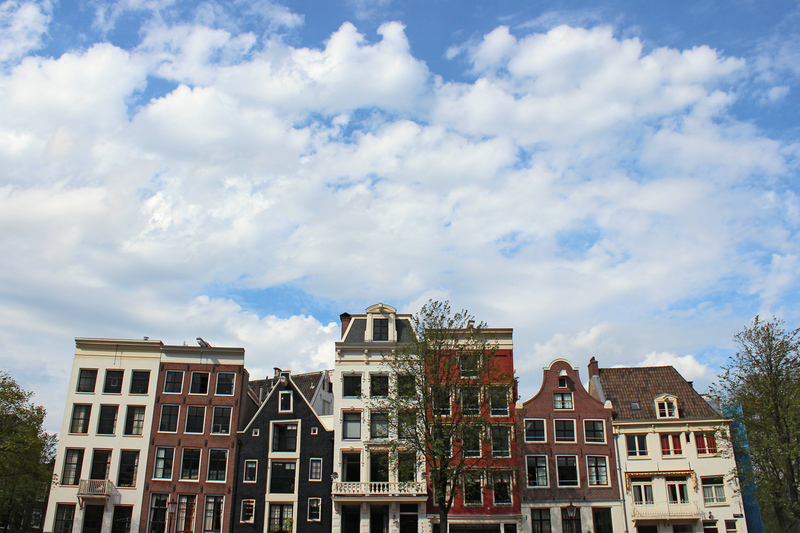 Radiating out from the city’s core, Amsterdam has three main canals: the Herengracht, the Keizergracht and the Prinsengracht. Over time hundreds of narrow streets and smaller canals have fanned out from the centre following the course of old paths. 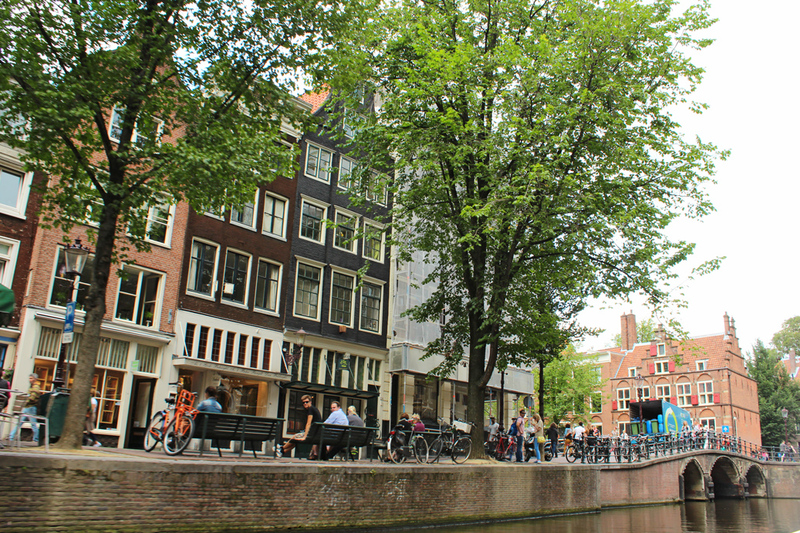 These man-made canals are really what characterize the city and its unique, romantic geography. 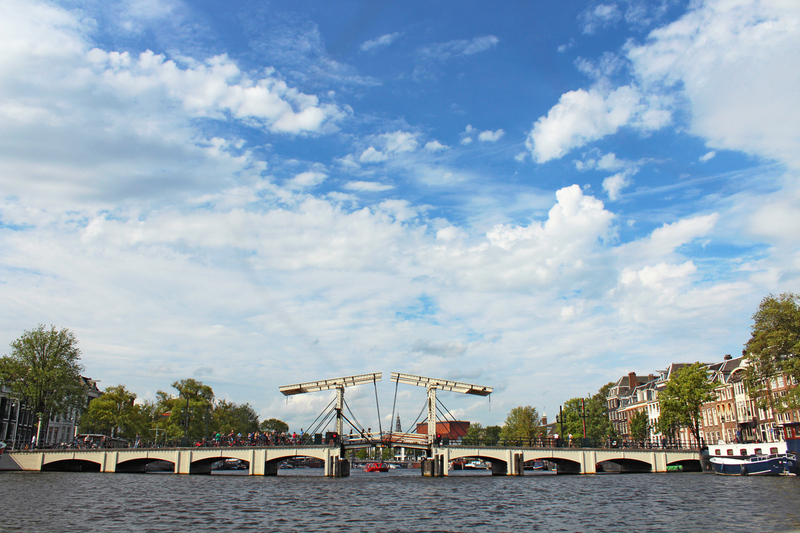 Since photographs speak louder than words, allow me to take you around Amsterdam’s canals through my lens. I hope you enjoy the sights as much as I did! All the routes start at the Central Station, and the first stop is usually Oudezijds Kolk. 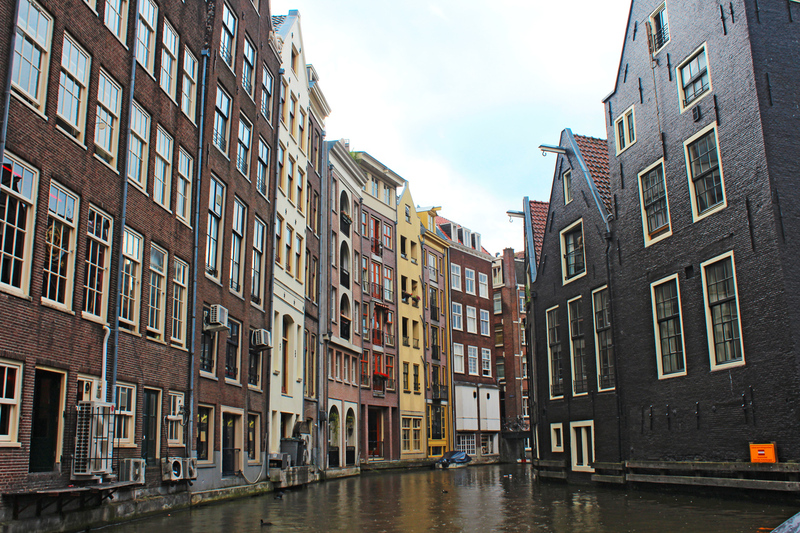 This is one of the last three locations left in Amsterdam where the canals have no streets alongside of them and the houses on the banks of the canals stand directly in the water. I think this might be my favorite part of the city. I was so fortunate to take the cruise on a clear day, the sun was slanting at just the right angle and the distinctive skinny buildings appeared even prettier than usual. As nice and neat these skinny buildings might look from the sidewalk, they don’t look quite as tidy near the roof line. The perspective changes at water level, and you can see how crooked and messy they are. Most alarmingly, some of them seem to be leaning so far over the street that they are in danger of falling forward…on you. Well, due to instability of the land, the planning laws in the 15th century were strict, and required that facades be built of lightweight materials. Taxes were charged according to the width of the frontage, which explains why most canal houses are lean and skinny. But there is a problem with lean and skinny houses like these though: they also have tight and narrow staircases. It didn’t take long until they figured out that it was impossible to get their furniture to the upper floors. So how did they solve the problem? Brilliantly! Just look carefully and you’ll see that every house has a large arm and hook stick out from the top. Items can be tied to this hook and pulled up to the desired floor. This explains why houses have a deliberate forward tilt: it minimizes the chance of items colliding with the building facade on their way up. Clever solution, right? 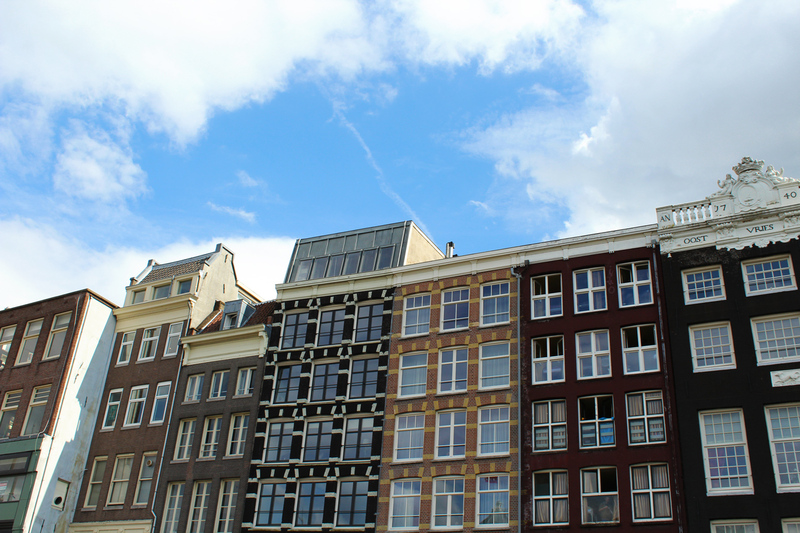 Some of Amsterdam’s houses also lean because of problems with the foundation or the ground underneath, so they have installed black braces on the front to help stabilize them. I find these old narrow houses so fascinating — just looking at them makes you wonder how many things they have seen throughout time! Yet just as this crooked urban landscape starts to overwhelm, something idyllic will catch your eye: tree-filled streets alive with birds and bees, pink and white flowers in bloom in every pot hanging on a bridge and beautifully-kept houseboats capped with potted plants. 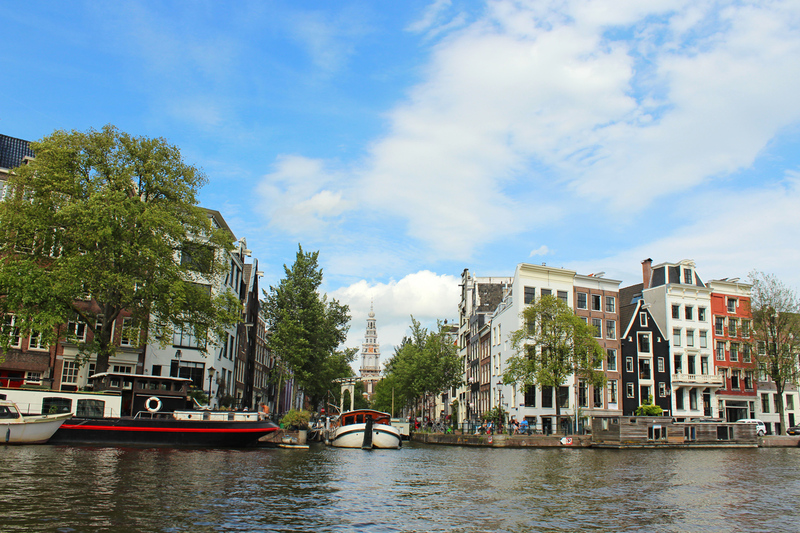 Amsterdam’s canals are home to some 2500 houseboats. They range from brightly painted boats, barges laden with planters full of colourful flowers to modern minimalist looking boats. Along with the more unconventional sights, I also got to see some pretty important historical landmarks. The Zuiderkerk, or South Church, was the first church built in the city for Protestant services. French impressionist Claude Monet painted the church 13 times during his visit to the Netherlands and our captain stopped for us to admire the exact angle as the Monet painting with the Groenburgwal canal leading up to it. 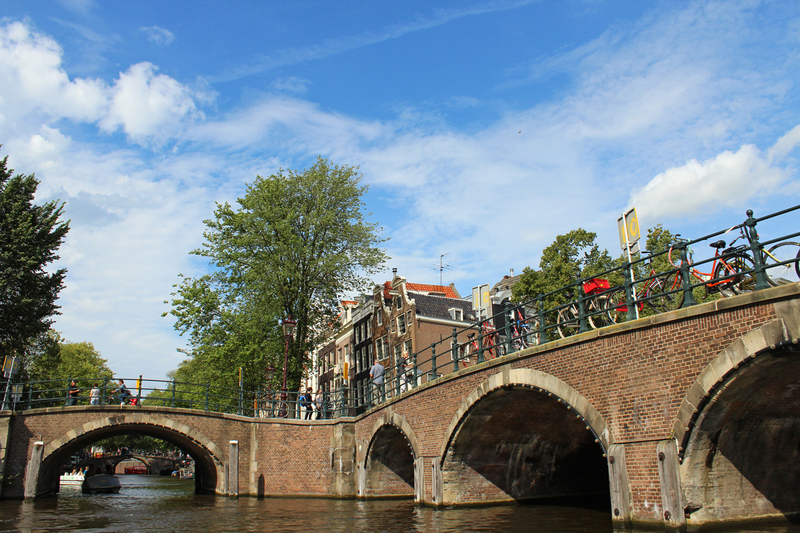 The bridge pictured above is the Magere Brug, or “skinny bridge”. It earned its name before the bridge was widened in 1871. Before the renovation, it is rumored that the bridge was so narrow that only one person could cross at a time, as it was not wide enough for people crossing in opposite directions to pass each other. This is one of the unique perspectives that only canal cruises offer: the Seven Bridges point. It’s the only spot in the whole city where you can see seven bridges line up behind the other in the distance. Sure, you sort of need a magnifying glass to actually see all the seven bridges, but still. Pretty awesome. As the locals will tell you, no trip to Amsterdam is complete without seeing just why this city is nicknamed the “Venice of the North”. You will have no trouble finding a boat to take you around the small canals, but in case you’re interested in this specific one, I took the Small open boat by The Canal Company . At €18 per adult, it’s a little on the expensive side, but I’m sure you will be happy to splurge a little for such a valuable experience!